The model load cell 615 belongs to the S type group of load cells. Transducers of this type are symmetrical and have threaded holes top and bottom to introduce the load which can either be in tension or compression. For simple weighing applications, for example a small hanging silo, the aluminum model 614 is quite sufficient, since the load is static. For dynamic applications, for example in filling and mixing plants, the alloy steel model 615 is more suited. 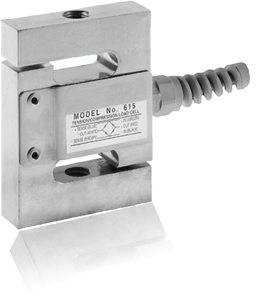 In the food industry, where aggressive cleaning agents are used, or in unprotected outdoor applications, the model 616 stainless steel load cells has to be used. Because of their good dynamic performance and their symmetrical design, S-shaped load cells also very often used as a force transducer. The 615 load cell is fitted with a 6 core shielded cable as standard. Special cables and lengths are available on request.